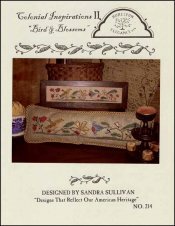 Colonial Inspirations 2: Bird & Blossoms [G1573] - $8.00 : Yarn Tree, Your wholesale source for cross stitch supplies. A yellow bird sitting on the stem of a flower. Can be stitched as a pillow or framed. The stitch count for the pillow model is 133w x 24h. The stitch count for the framed model is 133w x 24h.